After catching limits of rockfish on June 24, the Sheldon Johnson crew, including some of the crew members shown here, started bailing spot up to 10 inches. 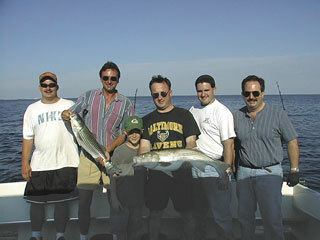 Here's a young member of the Dave Pounds crew from the evening of June 17 with a real fine yellowfin trout. 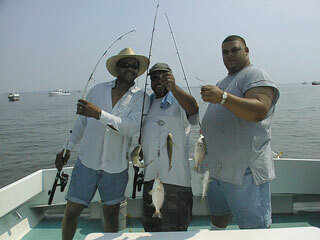 And here's the Bill Wikert (left) crew of June 17, who caught rockfish up to 32 inches while trolling the mid-Bay area. Here's a closeup of James, who managed to catch a double header on rockfish, one 29 inches and the other 32 inches (shown). What a thrill that was for all aboard. 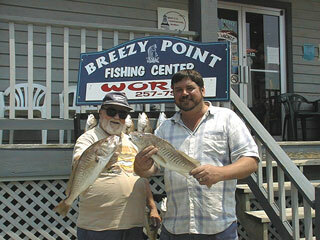 Here we have Russell Coates (left) and crew member Cliff with a couple real nice seatrout, caught June 16 while bottom fishing. 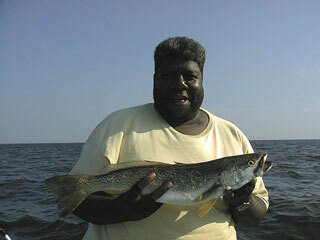 Here's Rickey, another member of Russell's crew, with a 24 inch yellowfin. 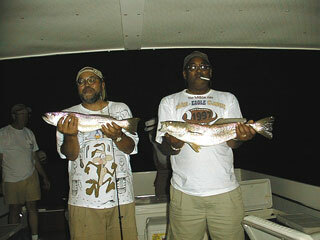 Not to be outdone, here's Jimmy with a double header on seatrout. 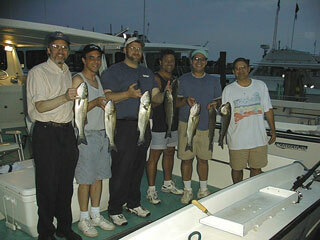 Here we have the Ira Reiz (2nd from right) crew with some of their rockfish caught June 15. Unfortunately, the forecast of tornadoes kept us from finishing our afternoon on the Bay. 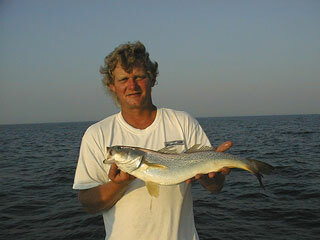 Here's Lou, a member of the Robert Christ crew of June 10, with a 24 inch seatrout. After catching limits of rockfish it was off to the croaker grounds for a few sunset hours of bottom fishing. 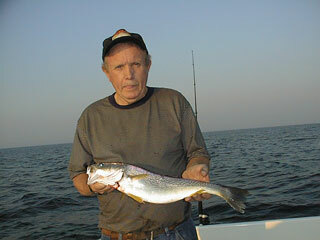 A good bunch of croaker to 18 inches and a dozen or so trout were caught on either shrimp or soft crab. 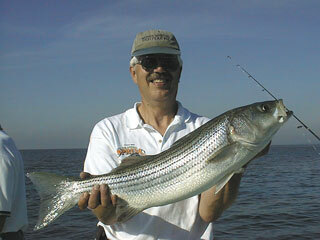 One of our favorite rigs for summertime rockfish is an umbrella double-rigged with bucktails and 6 inch shad. 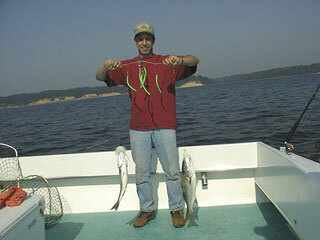 The leader from the umbrella arm back to the lure is about 18 inches of 80 lb. mono. 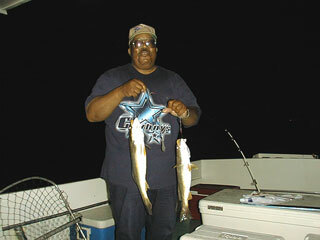 Here's a member of the Dave Reynolds crew with a double header on rockfish from June 10. 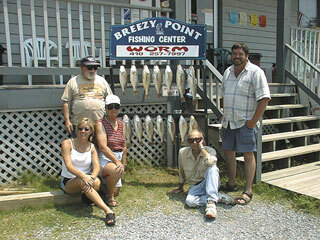 Here's the Tom Boyle (far right) crew of June 2 with a bunch of hefty croaker to nearly 20 inches. 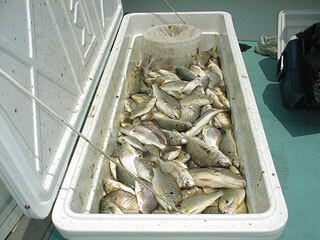 Although our primary target of the day was black drum, their close cousins -- the croaker -- provided lots of fun. 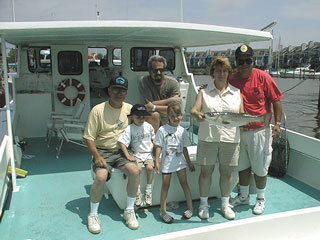 Other crew members included Jim (standing) and in the front row that's Pam, Miss Kitty and Charlie of Breezy Point Fishing Center. 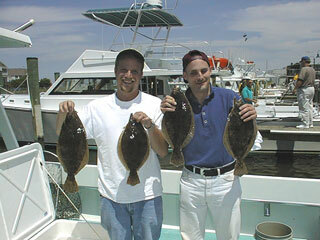 Here's Jim and Tom with two patch-sized croaker, both over 19 inches. Congratulations guys!